Migrating Jerry’s regular ol’ WordPress blog to WordPress MU was no easy task. In fact, it was downright nerve-wracking at times. But one look at the growing community of Tripawds Bloggers makes it all worthwhile. Knowing that pawrents are using their Tripawds Blogs to share their stories and photos is heartwarming. And knowing they find it helpful and cathartic when coping with cancer or amputation for their pup is even better. 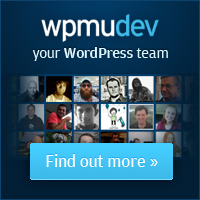 It is WPMU that makes the Tripawds Blogs community possible. And I couldn’t have developed this site without the help of many thoughtful experts in the WordPress MU support forums. But it was our WPMU DEV Premium membership that really helped make it what it is. Thanks to the premium wpmu plugins and support, we are able to offer all the functionality Tripawds blogs have to offer. This is also how we are able to offer WordPress tutorial videos to help users get started blogging. Now if only we could figure out a way for this to pay for all our efforts! 😉 But that’s why we have banner ads on blogs and why we implemented Tripawds Supporters to automatically remove those ads upon upgrade. It’s also why we’ll most likely need to have annual fund raising campaigns and why we kindly accept any contributions. Thank you all for your continued support! Well, the first half of that was all another language to me! I’m just glad that what you did works. If it would help in your efforts, I have no problem keeping ad banners on top of my blog-I just wanted to keep blogging and had run out of room! If there is something I can do to support tripawds.com (limited financial resources however) please let me know. You’re already doing it. Thank you! Next Next post: I am impressed. And relieved.